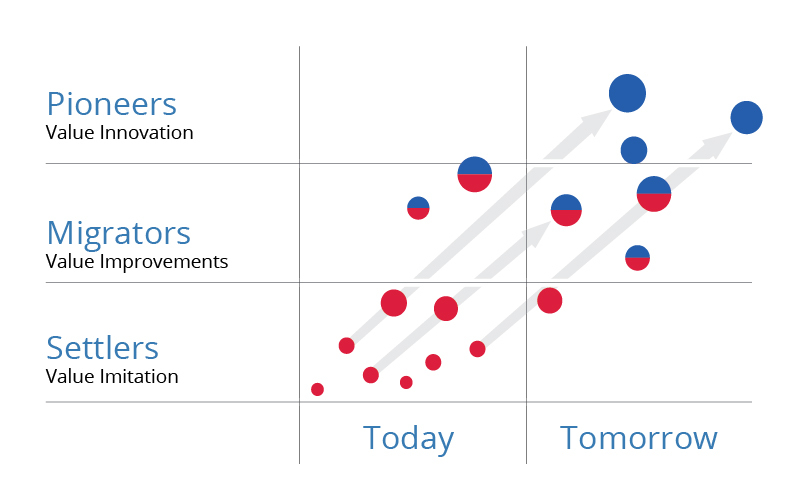 A useful exercise for a corporate management team pursuing profitable growth is to plot the company’s current and planned portfolios on the Pioneer-Migrator-Settler Map created by W. Chan Kim and Renée Mauborgne. Settlers are defined as me-too businesses, migrators are business offerings better than most in the marketplace, and a company’s pioneers are the businesses that offer unprecedented value. These are a company’s blue ocean strategic moves, and are the most powerful sources of profitable growth. They are the only ones with a mass following of customers.